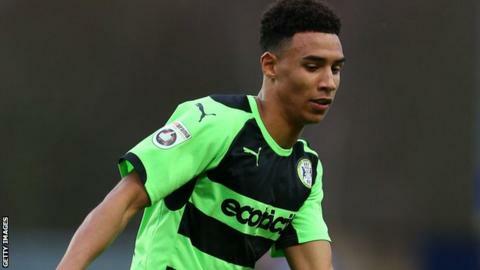 Jack Holland scored an injury-time equaliser for Bromley to dent Forest Green Rovers' automatic promotion bid. Kurtis Guthrie's first-half brace put the visitors in control, his first coming from a redirected Brett Williams' shot before a close-range second just before half-time. Pierre Joseph-Dubois halved Bromley's deficit from six yards out. Despite Paul Rogers sending' off, Holland rescued a point for Bromley when he headed home in stoppage time. "I'm very annoyed. They let me down today, they let all my staff down. To go 2-0 up, 10 men, the second half is just not acceptable. "Why should I be on the sidelines shouting and hollering, it all comes to how badly they really want it, I badly want it, all my staff badly want it, the fans want it. "It all depends if they really want it and some of them have really got to look at themselves now because Cheltenham are in the hot seat." Match ends, Bromley 2, Forest Green Rovers 2. Second Half ends, Bromley 2, Forest Green Rovers 2. Goal! Bromley 2, Forest Green Rovers 2. Jack Holland (Bromley) header from a difficult angle on the left to the centre of the goal. Assisted by Adam Cunnington. Attempt saved. Joe Anderson (Bromley) right footed shot from long range on the right is saved. Substitution, Bromley. Rohdell Gordon replaces Pierre Joseph-Dubois. Paul Rodgers (Bromley) is shown the red card. Substitution, Forest Green Rovers. Kieffer Moore replaces Brett Williams. Substitution, Bromley. Louis Dennis replaces Adam Coombes. Goal! Bromley 1, Forest Green Rovers 2. Pierre Joseph-Dubois (Bromley) left footed shot from the left side of the six yard box to the bottom left corner. Assisted by Adam Cunnington with a headed pass. Substitution, Forest Green Rovers. Sam Wedgbury replaces Rob Sinclair because of an injury. Paul Rodgers (Bromley) wins a free kick. Hand ball by Darren Carter (Forest Green Rovers).